Here at Langstone Cliff, we pride ourselves on our extensive meetings and conference facilities as one of the leading conference venues Devon has to offer. When you think of conference venues and meeting rooms, Devon isn’t the first place which naturally springs to mind, however, we’re going to change your mind using the power of research. Taking your business to the sea has a wealth of health, productivity and financial benefits which will make you think twice when planning your next corporate endeavour. The Langstone Cliff Hotel is only a stone’s throw from the crashing ocean waves of the Devonshire coastline. Did you know that research proves that the sound of waves rushing over the sandy shores alters wave patterns in the brain lulling you into a deeply relaxed state? For some this might seem pretty obvious; however, relaxing in this way can help rejuvenate the mind and body and make a productive and stress free decision making mindset. For those who relish the opportunity to get out of the office and into a homely yet professional environment where you can get things done, keep reading. Devon offers incredibly cost effective meeting rooms whilst delivering the high standard of customer service and luxuries you’re used to. While South Devon attracts its fair share of business tourism, there is always room for a little more and it’s a no brainer if you’re tightening your companies’ purse strings in 2017. Studies have shown that sea air is a magnificent ingredient which can aid a harmonious nights kip. Sea air is apparently charged with healthy negative ions that accelerate your brain’s ability to absorb oxygen. In turn, this gives you that gracious night’s sleep required to have a productive day and successful day in the boardroom. Tensions can sometimes run a little high in the meeting room especially if your team are under pressure to make difficult business decisions. Fresh sea air is stuffed with natural chemicals known to help balance levels of serotonin which is a hormone linked with mood and stress. This is often why you tend to feel a lot more alert, relaxed and energised when returning to work after a holiday by the sea. If so, the main point to take away from this is that by essentially taking your business to the seaside, you will benefit mainly as its cost effective and more fun, especially if we’re talking about Dawlish. Why not plan your Devon conference or team outing and come pay us a visit at the Langstone Cliff. 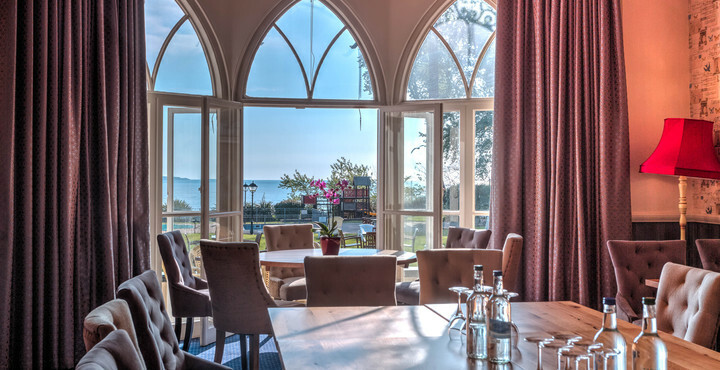 Our sea view conference facilities are only a stone’s throw from Exeter and Torquay and our prices are extremely competitive. Alternatively, you can enquire about each of our function rooms by calling us on 01626 221329 or by contacting us here.